Four CMS fall sports teams won SCIAC regular season and/or SCIAC Tournament championships—marking another successful start to the school year for CMS Athletics. Here’s a rundown of the highlights. A football first: For the first time in program history, the Stags qualified for the NCAA Division III football playoffs. In their opening-round playoff game, CMS lost to Whitworth University. During the regular season, the Stags were co-champions of the SCIAC for the fifth time and the first time since the Stags won back-to-back conference titles in 1986 and 1987. With the conference’s best all-around defense and a run-first offense, CMS finished with a 7-4 record, 6-1 in SCIAC, defeating Northwestern (Minn.), La Verne, Cal Lutheran, Redlands, Occidental, Whittier, and Chapman. 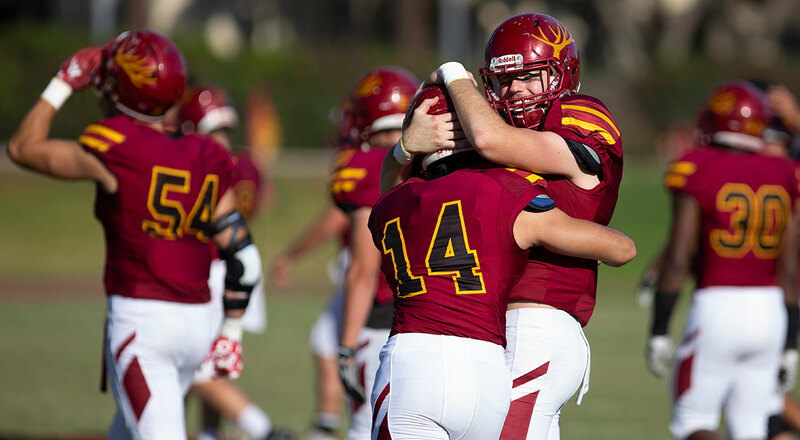 Linebacker Mitchell Allan ’19 was named the conference’s Defensive Player of the Year while running back Garrett Cheadle (HMC ’20) was the SCIAC Offensive Player of the Year. The Stags’ coaching staff led by Coach Kyle Sweeney was the SCIAC Coaching Staff of the Year. Streak continues for cross country: Nationals have become a regular occurrence for the Athenas and Stags. This marked the 10th season in a row that both CMS cross country teams qualified for the NCAA Division III Championships. The Athenas placed 18th nationally, led by Malea Martin ’19, and the Stags placed 27th, led by Miles Christensen (HMC ’22). Prior to Nationals, the Athenas and Stags won the NCAA West Regionals (the Stags tied for first). The Athenas also won the SCIAC Championships for the ninth season in a row. The Athenas’ coaching staff, led by Coach John Goldhammer, was the SCIAC Women’s Cross Country Coaching Staff of the Year. Four-peat for volleyball: The Athenas continued their run of conference supremacy, winning both the SCIAC regular season and postseason tournament championships. CMS has now won at least a share of the regular season conference title in each of the last four seasons, to go with three SCIAC postseason tournament championships during that time. CMS also advanced to the NCAA Tournament for the sixth season in a row. This year, the Athenas reached the second round of the NCAA Tournament before falling 3-1 to the University of Wisconsin-Eau Claire. CMS had 27 wins in 2018, which tied for the second-most in team history. Phoebe Madsen ’20 became the second player in CMS volleyball history to earn first-team All-America honors, while Amanda Walker (SC ’20) was third-team All-American. The Athenas’ coaching staff led by Coach Kurt Vlasich was the SCIAC Coaching Staff of the Year. Swarming defenses propel soccer: What a difference a year can make. One season after finishing eighth in the SCIAC standings, the Stags won the 2018 regular season conference championship and advanced to the SCIAC Tournament semifinals. CMS won more games (15) in 2018 than it had in a season since 2001. Stifling defense was the Stags’ calling card as they allowed just four goals all season with 15 shutouts, en route to a 15-2-1 record. The team’s goals-against average (0.216) ranked first nationally. Six Stags were chosen as first-team All-Conference: goalkeeper Jacob Mays ’22, defender William Birchard ’21, defender Adam Singer ’20, midfielder Nate Huntington ’21, midfielder Aidan Johnson ’19, and forward William Barton ’22. The Stags’ coaching staff led by Coach Matt Edwards was the SCIAC Coaching Staff of the Year. The CMS women’s soccer team also had a strong 2018 season led by its defense, going 8-5-4 overall. The Athenas allowed just 10 goals in their 17 matches for a goals-against average of 0.55. Midfielders Sarah Malott ’19 and Rhiann Holman ’20 were first team All-SCIAC selections. Stags finish as water polo runner-up: The Stags made a run to the SCIAC Tournament finals this season, and fell in the championship match to Pomona-Pitzer. In the conference semifinals, CMS defeated a strong Whittier squad, 13-6. Overall, the Stags had a 16-11 record, including a 10-4 conference record. Zack Rossman ’20, Ethan Lewis ’20, and William Clark ’22 earned three of the 10 spots on the men's water polo All-SCIAC first team.